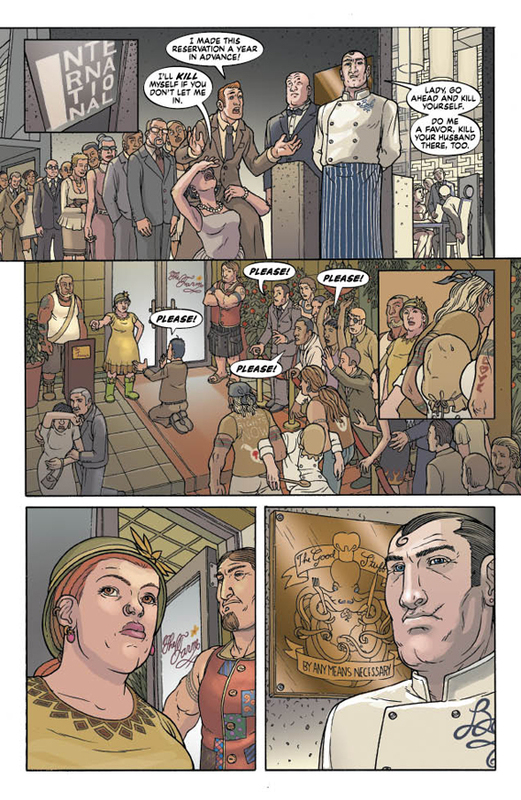 What if violent clan warfare revolved not around religion or land, but extreme attitudes about food? 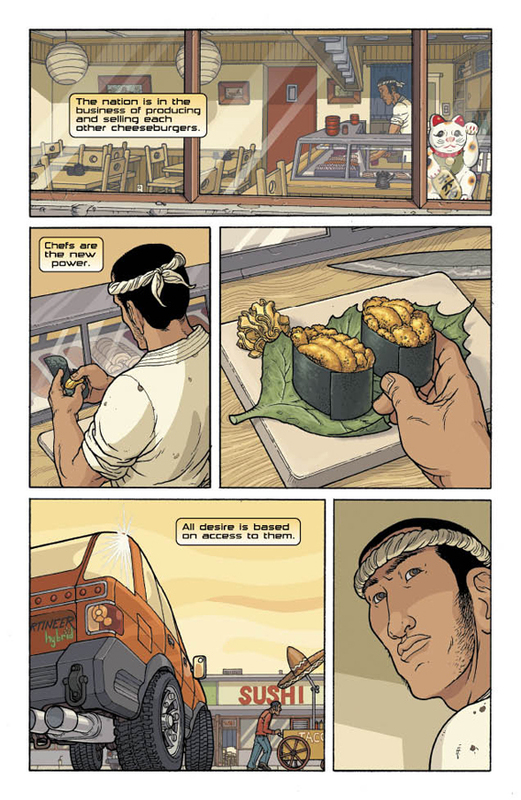 In master chef and celebrated foodie author Anthony Bourdain’s first foray into the graphic novel genre, Get Jiro! 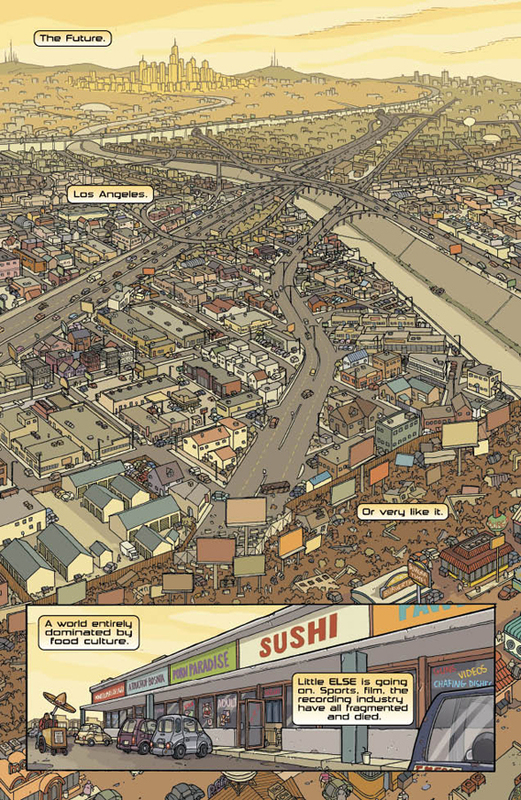 (Vertigo), near-future Los Angeles is a dystopian culinary landscape dominated by warring clans of chefs – the Internationalists, who blend foods from all over the world into exotic dishes, and the Vertical Farm of militant macrobiotics who prepare nothing but organic, vegetarian dishes. Into this tinderbox of arrogance and intolerance walks Jiro, an old-school Japanese sushi chef who just wants to do his thing without anyone dishonoring his delicious food. 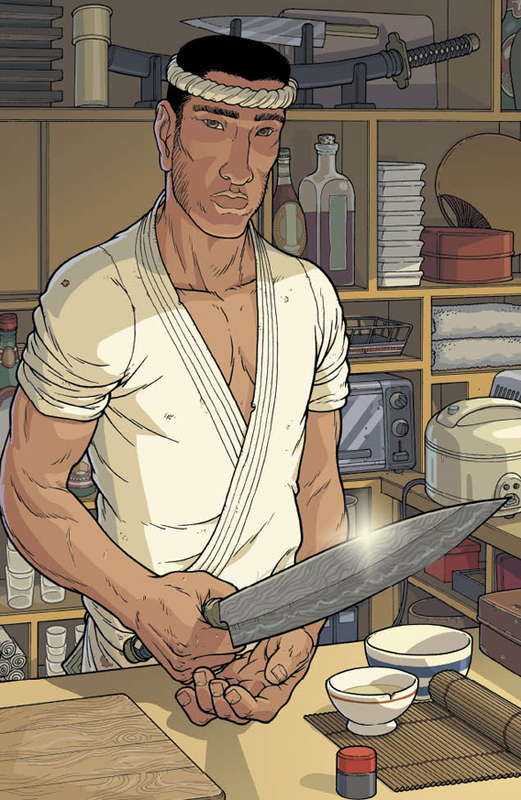 Jiro is particularly uncompromising in that way, living by the (exquisitely sharpened) blade and showing no quarter to artless belligerents, and his knife skills are ascendant: “He works his way around the bone, rather than through. 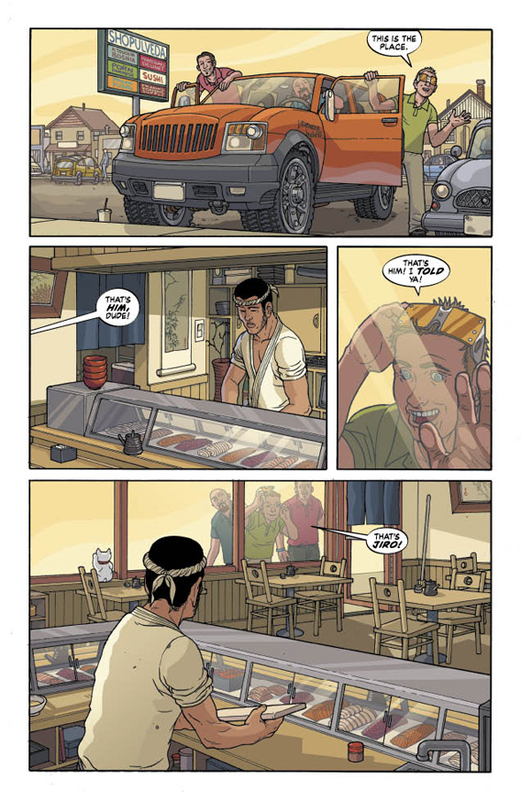 (Beat) As one does,” said Bourdain, who's loved to “geek out” on comic books from childhood. He lets his love for spaghetti westerns and samurai flicks run wild in this bloody, beautifully drawn “Bento Box” art book. The intersection of cuisine, culture and conflict is one Bourdain witnessed quite literally during the filming of an episode of his television show, “No Reservations,” in Beirut in 2006. “We went to Lebanon looking to make a happy food and travel show about a resurgent country,” as he put it. Instead, he watched Israeli fighter jets bomb the Beirut airport from the balcony of his hotel room while Hezbollah fighters fired automatic weapons in the air celebrating the kidnapping of Israeli soldiers. 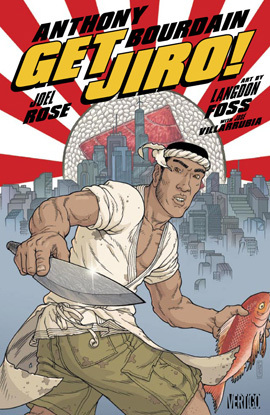 In that light, Get Jiro!’s acid satire of militant foodies enforcing their convictions “by the sword” reminds us, amid the explosion of foodie culture in the United States in particular, that we may just be taking the supremacy of food a bit too much to heart. 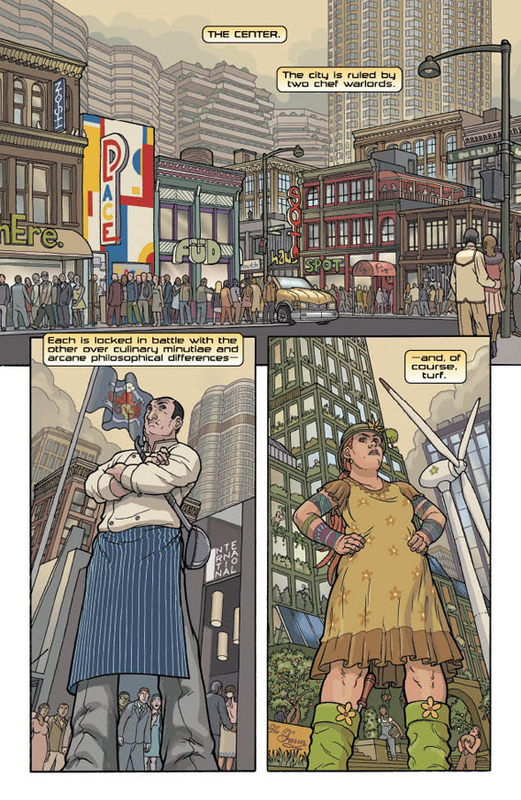 Excerpted with the permission of Vertigo Comics.